Eggshell Slate Address Plaque - - includes your house number and your name. Made in USA. Made from hand-cut, fine-grained slate. The UV-printing process produces incredibly high definition and a weather-resistant finish. House number up to 8 characters. Name up to 30 large characters printed in all caps. Note: character count includes punctuation and spaces. Two mounting options: wall mount or hanging. Please select the hole location you prefer in the drop-down box above. Includes all mounting hardware. Colors: eggshell slate with blue printing. 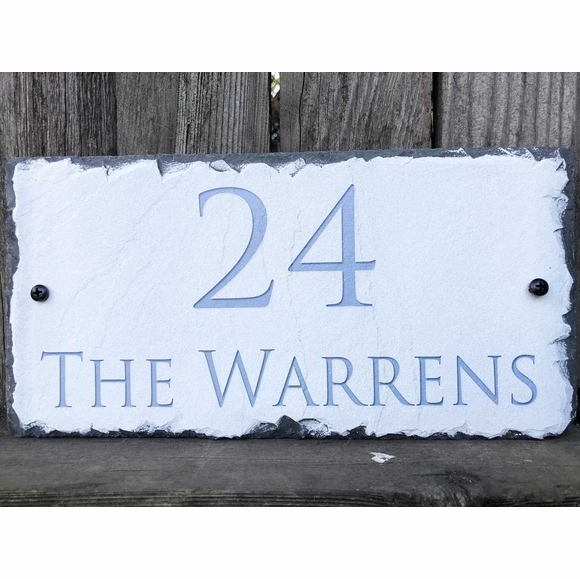 Address and name shown above: 24 THE WARRENS.